Patrice Remarck, a top USA Taekwondo instructor has urged the sports authorities and sponsors to support Ghanaian Taekwondo athletes as they have the technique and potential to become champions in the near future. The former USA Olympic and World champion, as well as a trainer of the US Armed Forces who was born in Cote d’Ivoire, said Ghanaians are good in sports and when given the right training and resources, they can become champions. He adviced the coaches with Grade C license certificate to have self-belief, aim higher to reach the top level, by remaining disciplined, learning more with regular training and know where they are going. “Results are possible if you work hard to achieve it, so aim high and use the systems,” he said. The Development of National Sports System (DNSS) course which was organized by the Ghana Taekwondo Federation (FTF) with support from the International Olympic Committee (IOC) and Ghana Olympic Committee (GOC) ended at the Korea Sports Complex at Tema, Community 3 on Friday April 12, 2019. 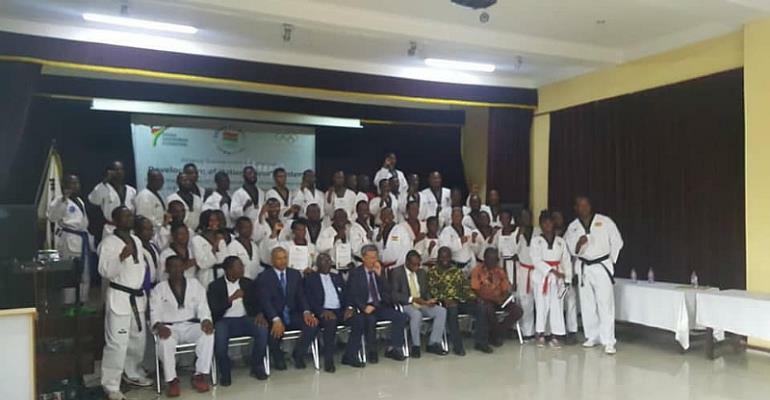 Mr. Fred Otu Lartey, President of the Ghana Taekwondo Federation (GTF) congratulated the coaches drawn from all over the regions and institutions with words of inspiration and asked them to impart what they have learnt to the benefit of the nation. He said Ghana is making history and progress in Taekwondo as his federation has trained over 100 practitioners in Administration and Communications, Refereeing and Coaching under the DNSS programme with the target of winning an Olympic medal in the future, possibly Paris 2024 or 2028. He introduced and applauded the three athletes and a coach who represented Ghana at the 2019 Abuja Open in Nigeria and did Ghana proud by winning silver and bronze medals. Mr. Lartey who is Treasurer of the GOC said the athletes and coaches need more support and exposure to modern trends in the sport to achieve their targets. He asked them not to relent but work hard and cooperate with each other with frequent communications and competitions. He then praised those who have contributed to the promotion and development of Taekwondo in Ghana. H. E. Kim Sung Soo, the Korean Ambassador to Ghana who had been supporting the federation congratulated the participants and the resource person as well as the media. He said Taekwondo is more than a sport, as it molds practitioners to be much disciplined. He urged the coaches to spread the message of Taekwondo. Prof. Peter Twumasi, Director General of the National Sports Authority (NSA) who graced the closing ceremony said out of the 43 sports disciplines, Taekwondo seems to be performing very well. “Ghana has talent, we lack the ingredient of coaching so this programme is laudable and inspiring as it can produce more champions for the nation,” he said. He expressed satisfaction that the GTF has a database which can help to identify athletes easily. The General Secretary of the GOC, Richard Akpokavie reminded the coaches about the values of Olympism; Excellence, Friendship and Respect. He promised that the GOC is ready to support federations that come up with positive development programmes through the Olympic Fund. Prosper K. Medadues-Badohu, one of the coaches who evaluated the course stated content with what they learnt and pledged to unearth and groom other talents into champions. He noted that though Ghana Taewkondo is moving slowly, they are on the right path and are steadily moving forward. Sung Tai Kim the 8th-degree black belt, Technical Consultant of the GTF and Patrice Remark were presented with certificates of honour and appreciation after the closing ceremony.